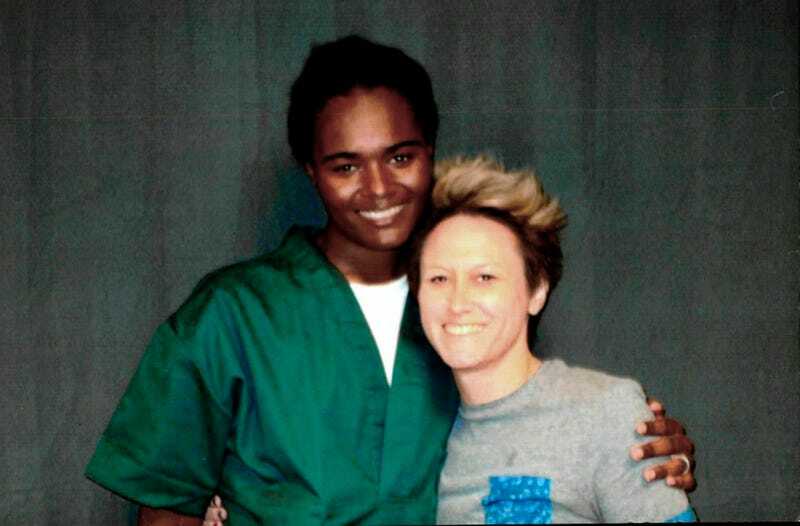 This 2018 photo provided by inmate Lindsay Saunders-Velez shows her, at left, with mentor Meghan Baker at the Colorado Territorial Correctional Facility in Cañon City, Colo.
A transgender woman who is currently suing the Colorado Department of Corrections says she was raped in a men’s prison just hours after a federal judge denied her request to stop the prison from keeping her in a disciplinary unit. In July, Lindsay Saunders-Velez, 20, filed a lawsuit calling Colorado’s prisons “discriminatory and dangerous” for transgender offenders, according to the Associated Press. She said that since entering the prison system last spring, she has been threatened, harassed and assaulted. In April, lawyers representing Saunders-Velez asked a judge not to send her to the punishment pod in the Territorial Correctional Facility for a disciplinary infraction because she could end up in the same pod as inmates who had tormented her before, but the judge rejected their request, saying that they had failed to prove an imminent risk. Paula Greisen, an attorney representing Saunders-Velez, told AP that her client was attacked in the pod and spent more than a week in the infirmary recovering. Medical records obtained by AP show that Saunders-Velez was taken to a hospital with rectal and other injuries the day after the judge denied her request. The inmate accused in the assault against her is possibly HIV-positive and an IV drug user, according to notes from the nurse who examined Saunders-Velez. Greisen said that Saunders-Velez’s case illustrates the threats and abuse transgender people face in prisons around the U.S.
Demoya Gordon, an attorney with the Lambda Legal Transgender Rights Project, told AP that by federal law, prison officials are required to individually assess where to house each transgender person—but almost all correctional facilities still house trans inmates based on genitalia or the gender assigned at birth. As a result, Gordon said, most transgender women are housed among men, and they are often harassed, abused or raped. In response to an AP request for information about the Colorado Corrections Department’s policies for transgender inmates and about supervision within different areas of the prison, agency spokesman Mark Fairbairn said that he could not comment on ongoing litigation—but he provided sections of the department’s policies that permit transgender offenders to receive sports bras and instruct staff that intentional misuse of gender pronouns is prohibited. Saunders-Velez was remanded to Colorado’s prison system in May 2017 after being sentenced to three years for violating the terms of a plea agreement on a felony menacing charge, and her lawsuit says that her problems began soon afterward. It is documented in court records that male inmates frequently pulled down a privacy screen shielding Saunders-Velez from view as she used the bathroom in her cell. She was threatened by other inmates, and in December, she was sexually assaulted by another inmate during a brief transfer to another Colorado prison. Her attorneys said that Saunders-Velez swallowed razors “to escape” and was sent to a hospital before being reassigned to the Territorial facility. Saunders-Velez filed a handwritten complaint in July, alleging that her right to protection from cruel and unusual punishment had been violated. Her requests to be called Lindsay and identified with female pronouns were denied by prison staff, as were her requests to be searched by female guards and to buy women’s undergarments and facial-hair remover. According to AP, there is at least one other inmate suing Colorado’s DOC over its treatment of transgender people. Black Magazines of the &apos;90s: Where Are They Now?